Are you ready to see Akshay Kumar in his best comic acting? Then, your wait is about to get over, as “Chandni Chowk to China” releases in the very first month of 2009. Directed by Nikhil Advani and produced by Rohan Sippy, “Chandni Chowk to China” has been shot mainly in China. 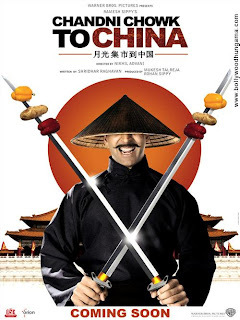 Not many know that initially, “Chandni Chowk to China” was called “Mera Naam Chin Chin Choo” and once “Made in China”. It was later when the makers decided upon the name “Chandni Chowk to China”. Scripted by Sridhar Radhavan, “Chandni Chowk to China” is a semi-autobiographical film about the leading actor Akshar Kumar. The super-hit music trio, Shankar, Ehsaan and Loy has composed music for the comedy Bollywood movie “Chandni Chowk to China”. Distributed by Warner Bros. Pictures and Ramesh Sippy Entertainment, this upcoming movie has been made out of great budget of $ 12 million or 51 Crores. “Chandni Chowk to China” is a movie about a cook from Chandni Chowk in India, who is mistaken as a reincarnation of an ancient Chinese warrior by the villagers of an oppressed Chinese village. Watch out for Deepkia Padukone in Chinese attire and doing all the stunts in “Chandni Chowk to China”.